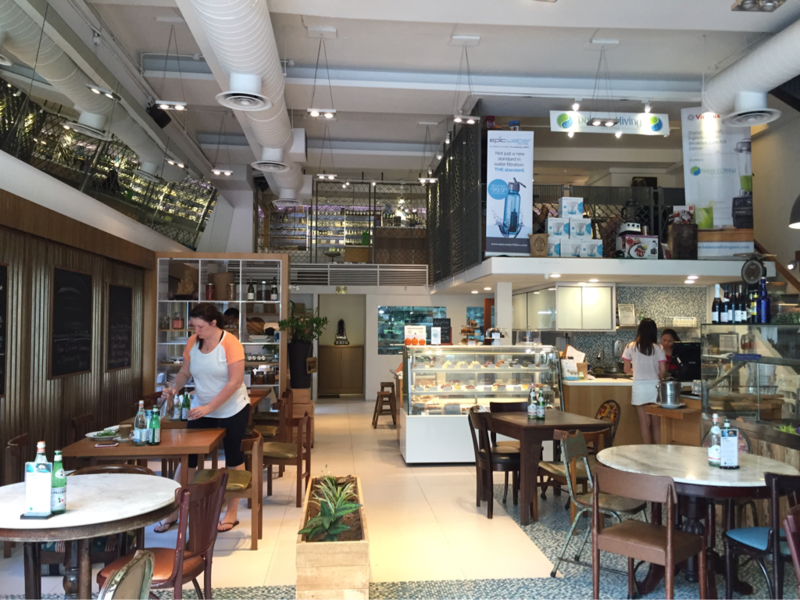 THE LIVING CAFE: Living a healthy lifestyle. 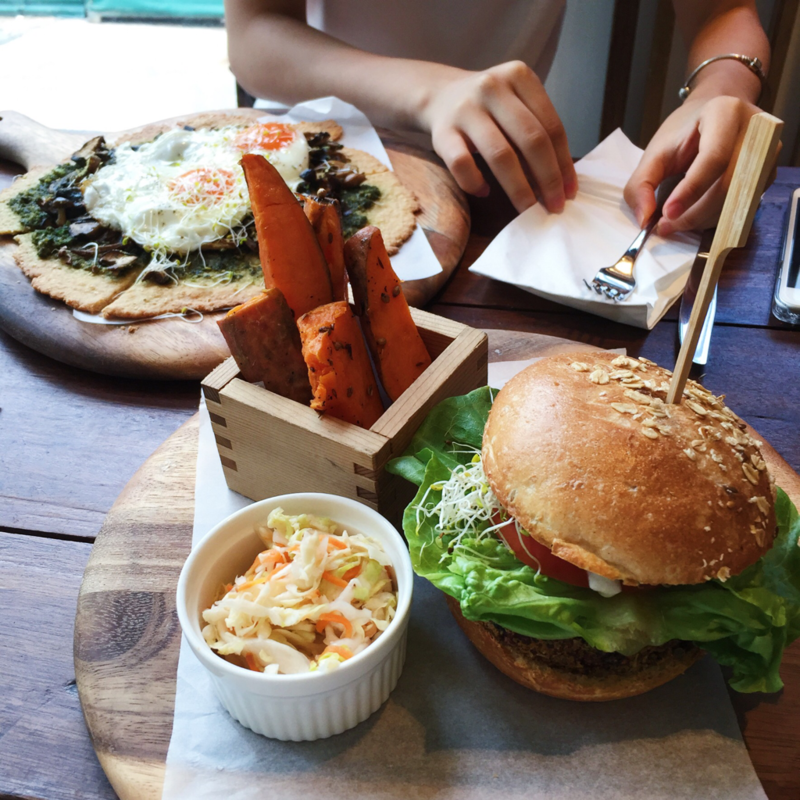 This is actually my second time here to The Living Cafe, the first was with my mom and this time, with my friend. 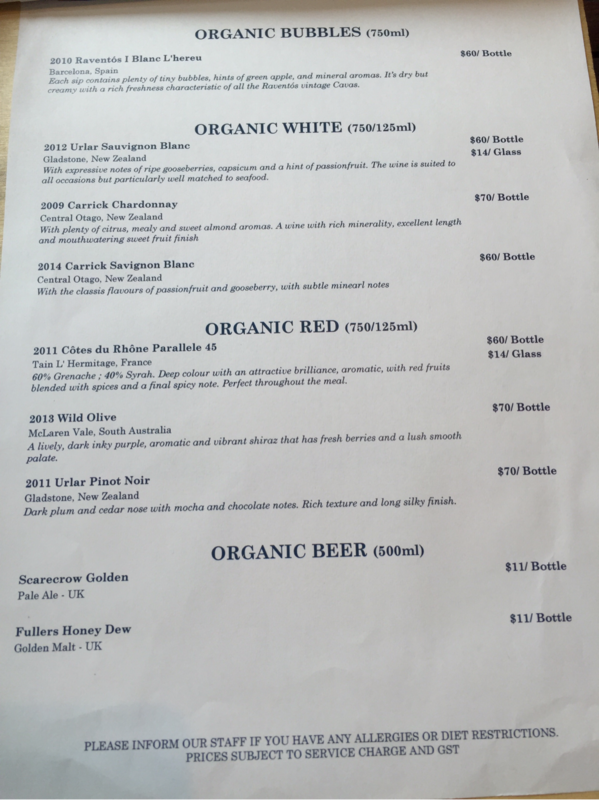 After my first visit with my mom, I thought that the food here was expensive and not worth the money. 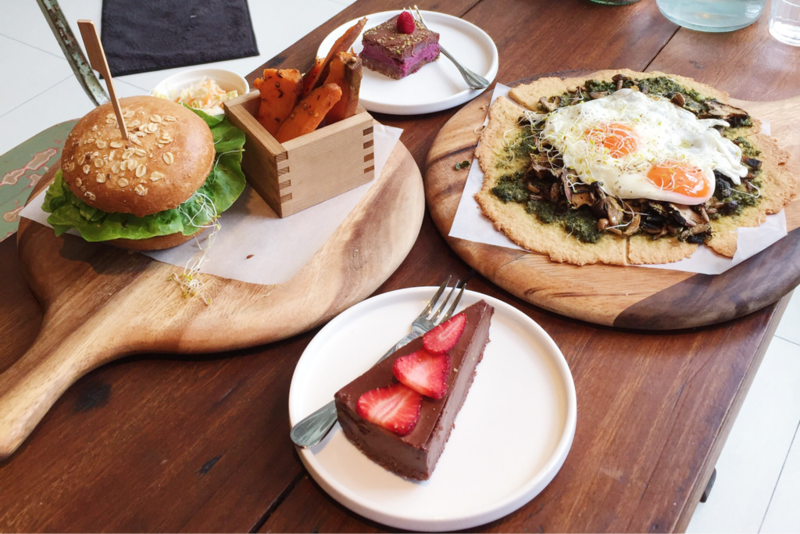 However, upon visiting this place for the second time with a friend of mine, I realised that it was just those two dishes that I tried on my last visit that weren't that good. 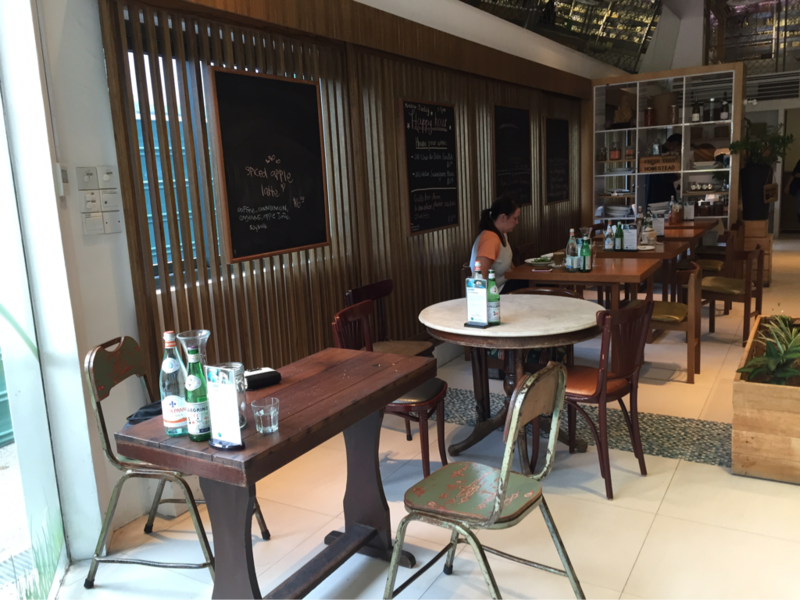 My second visit to The Living Cafe was a pleasant and memorable one. 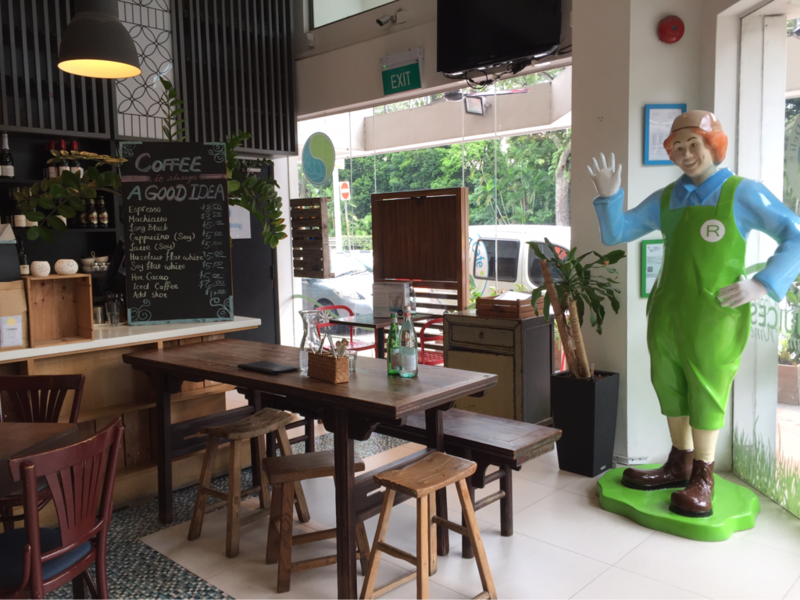 "At The Living Cafe (TLC) Singapore, we are constantly striving to create and provide genuinely healthy food and drink that is truly tasty, affordable, and accessible to everyone. 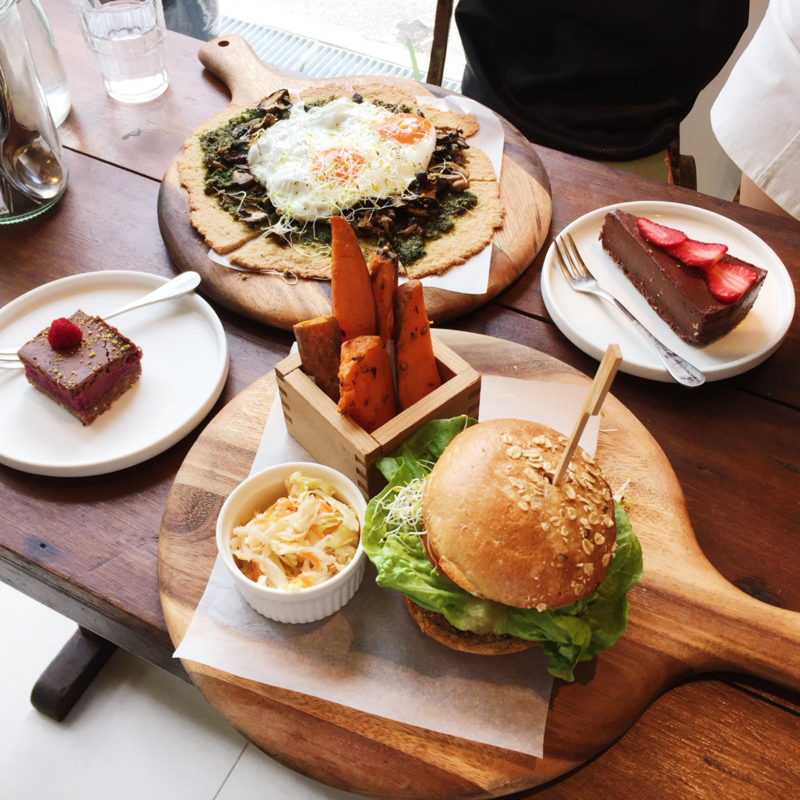 We use specially selected and sourced organic ingredients where possible and thoughtfully combine them to achieve optimum flavor for our healthy raw food café. 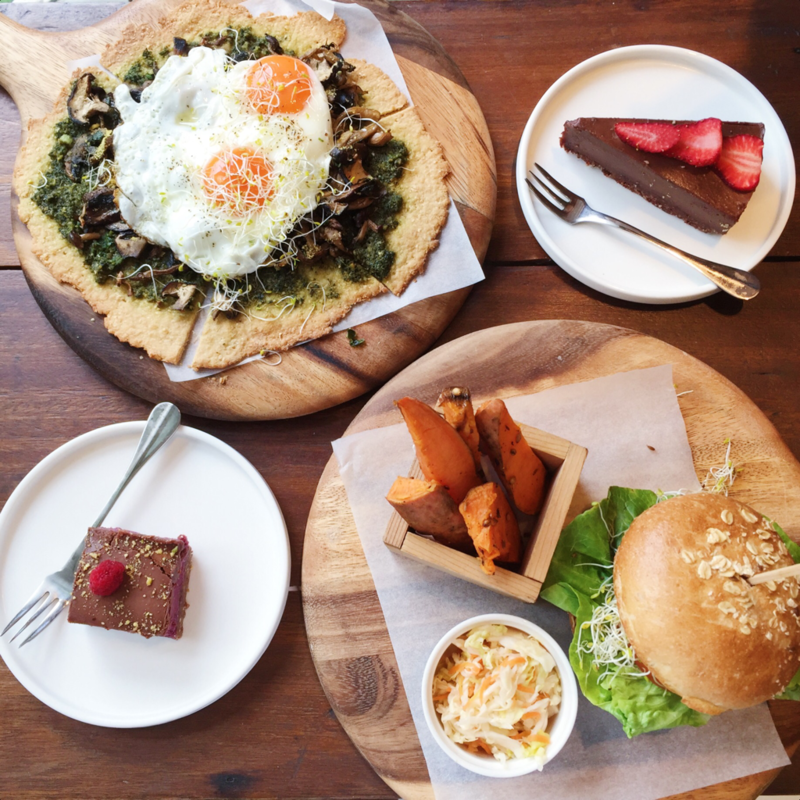 We want every visitor to be introduced to a recipe full of energy and vitality. 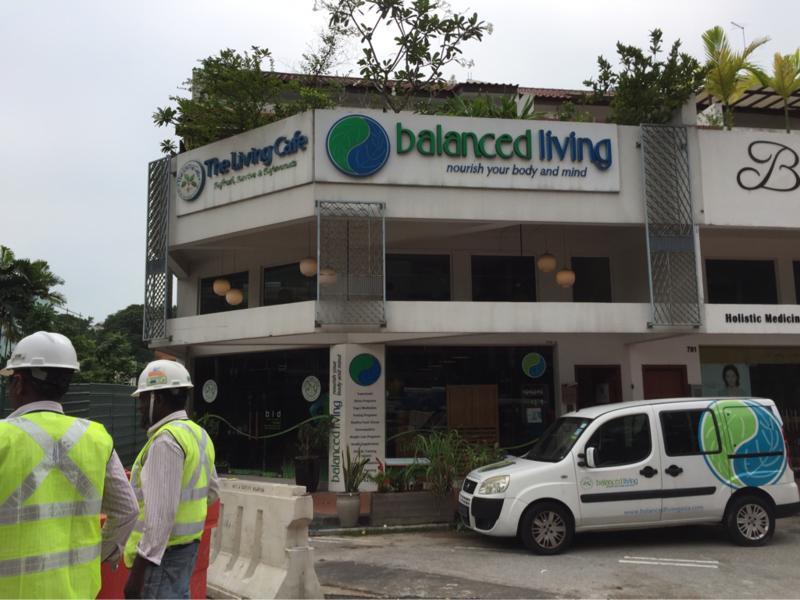 Large "balancedliving" sign with a smaller, not so visible "The Living Cafe" sign, can be seen from a distance. 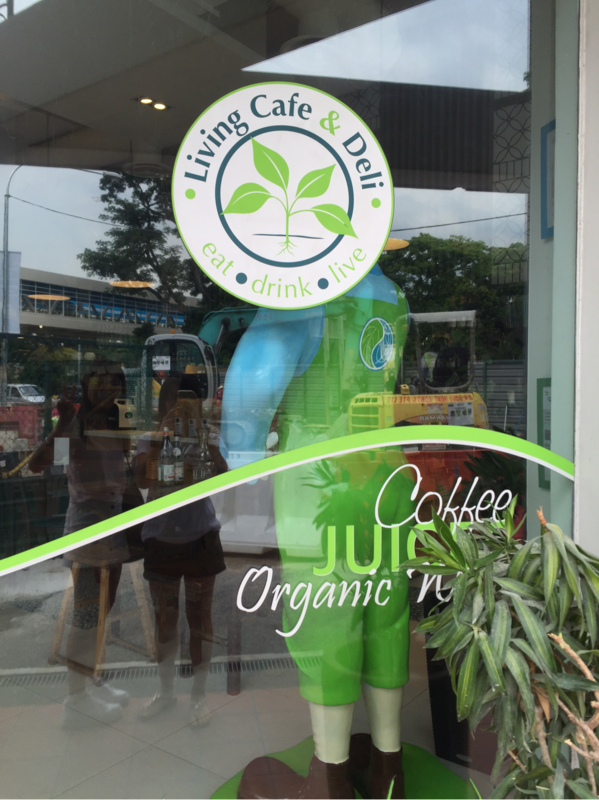 Big Living cafe logo displayed on glass entrance of the cafe. 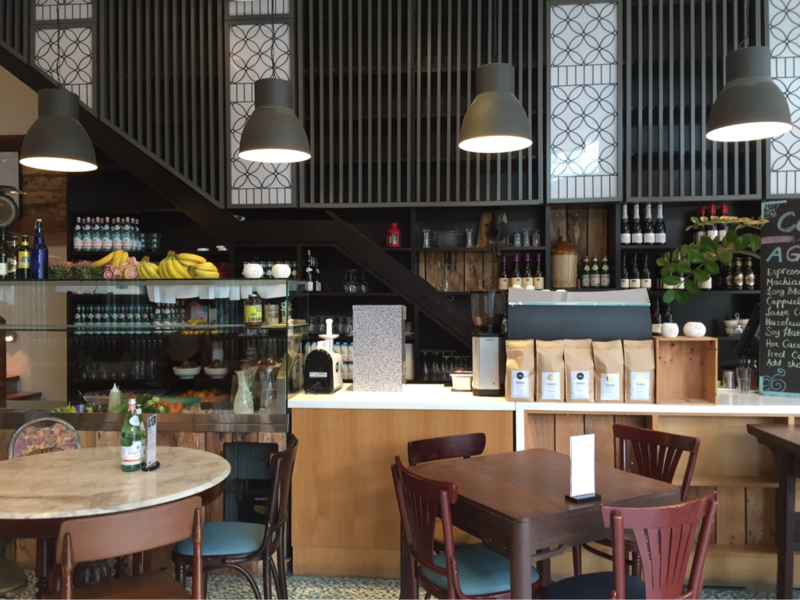 The cafe itself is spacious with a high ceiling, with plenty of seating area. 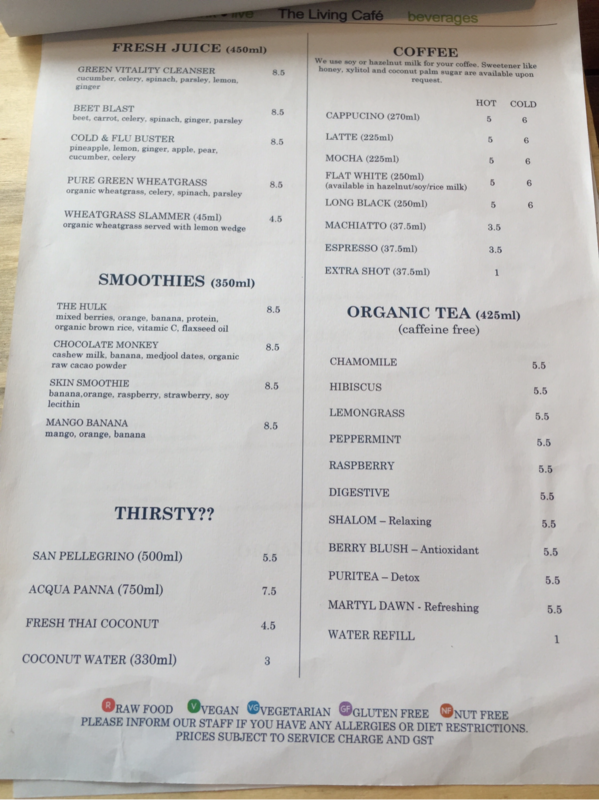 There is also a second floor to the cafe, selling many superfoods (however, this isn't the best place to buy these goods as they are pretty pricey). The place is pretty bright overall but on pictures, lighting isn't too good except for the seat closest to the window. 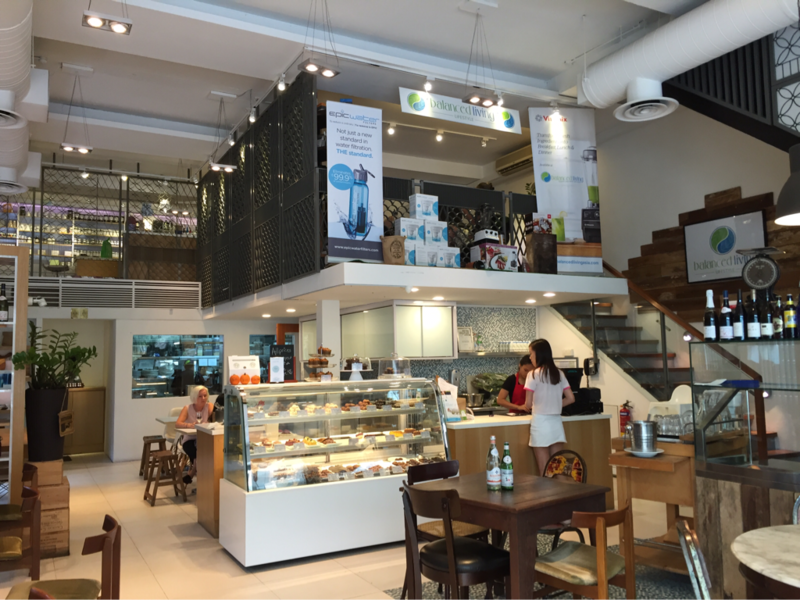 Really love the chill vibes of this cafe. 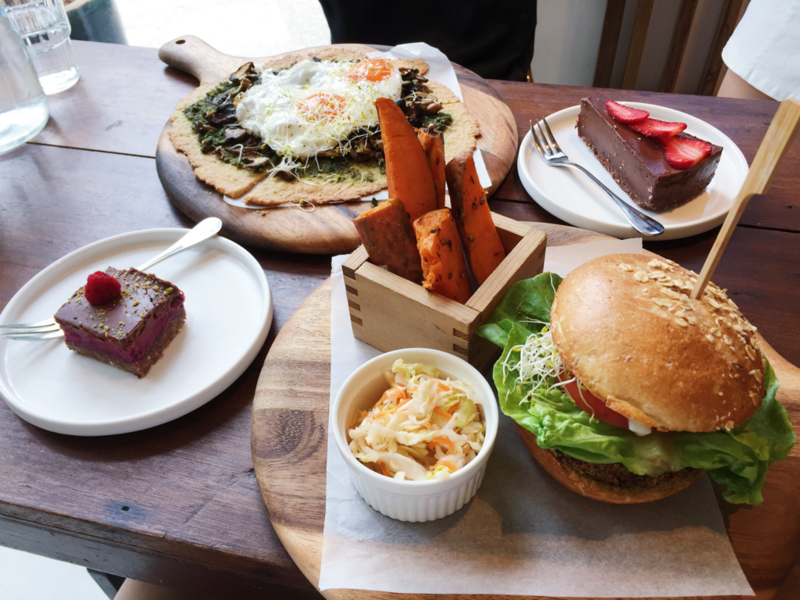 They have a pretty extensive menu, with plenty of options suitable for various diets such as raw diets, vegan diets, vegetarian diets, gluten-free diets and nut-free diets, so there's no need to worry about not being able to find something for everyone when you dine here at The Living Cafe. This is the herbed salmon burger I had on my first visit, when I was still a pescetarian. Basically, this was what made me have a bad impression of The Living Cafe... maybe it wasn't done properly or maybe it was just my bad luck on that day, but the dish just didn't impress me at all. 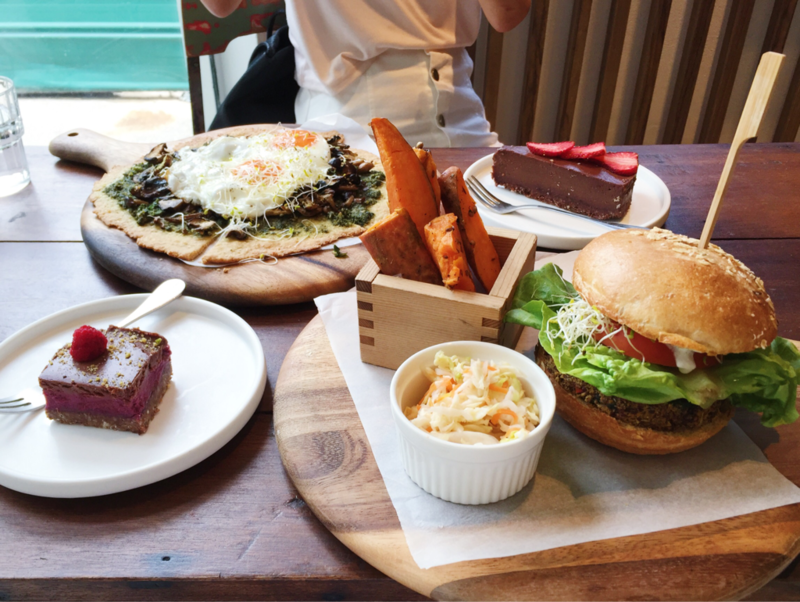 Other than the nice oat-topped bun which was nice and crispy on the outside and soft and fluffy on the inside, all the other components of the dish just didn't make the cut. The salmon patty was crumbly (too crumbly), under-seasoned and really fishy-tasting. No hint of herbs could be tasted causing it to lack nice flavour, such that the raw cashew mayo and raw sweet chilli sauce could not salvage the tasteless burger. The sweet potato wedges on the side lacked seasoning and was not roasted well, resulting in soggy uncrispy limp chunks of sweet potato. 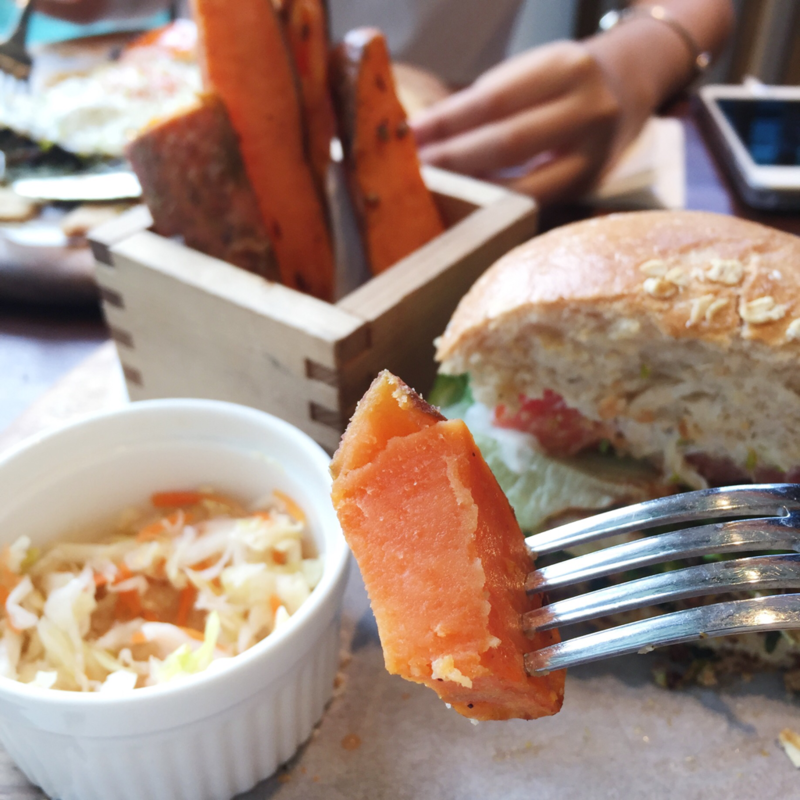 Undoubtedly, the sweet potato wedges were sweet, but it lacked the crispiness that sweet potato wedges ought to have. The coleslaw was also mediocre due to its dressing, which was probably only lemon juice, some salt and pepper. Even if the purpose was to keep it light, it still lacked seasoning and was pretty tasteless in my opinion. 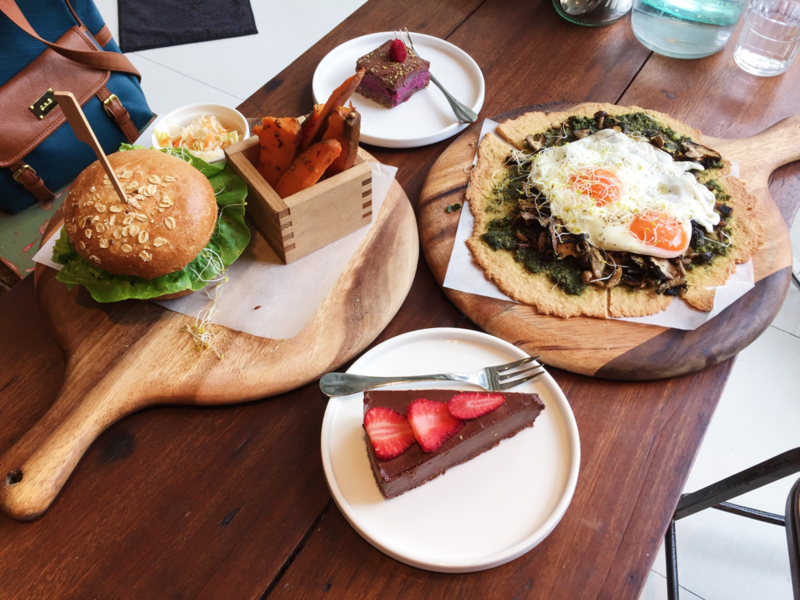 As a result of all this, I had a bad impression about the food from this cafe, but only realised that not all their food was like this until I gave them a second chance with my next visit. 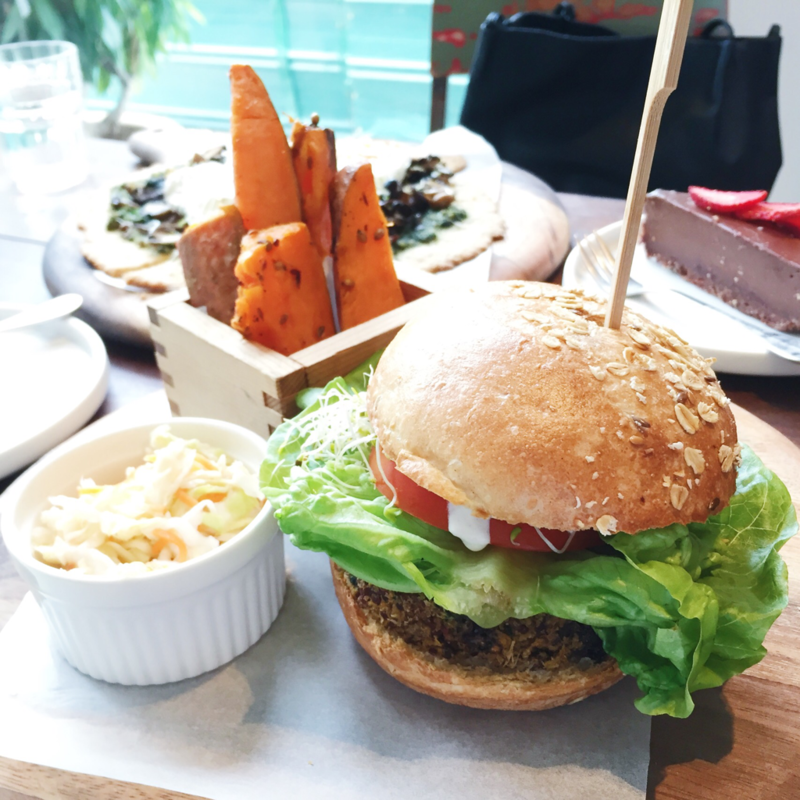 This was my quinoa veggie burger from my second visit, which was also what made me change my opinion of The Living Cafe. The burger buns were as soft and fluffy as before, toasted to crisp perfection. 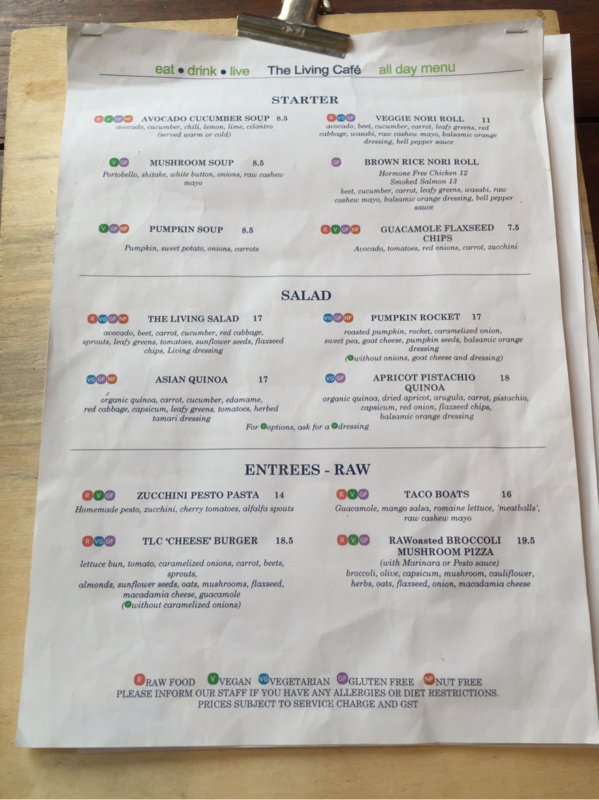 I loved the quinoa veggie patty. LOVE is an understatement. The patty was flavourful and moist, unlike most veggie patties you find elsewhere. 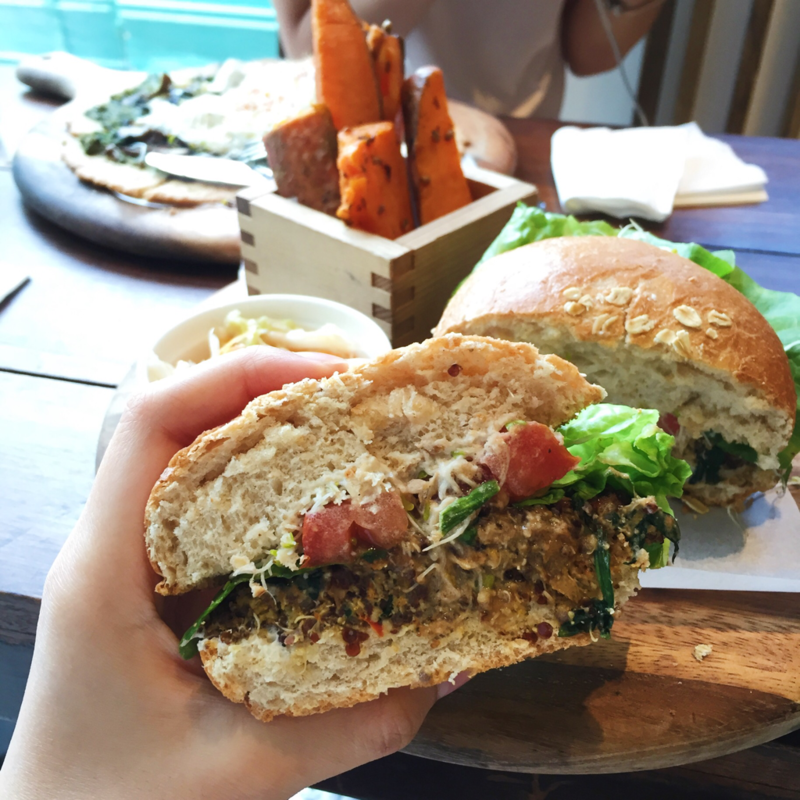 Even though its squidgy texture did not resemble that of a meat patty, it was still delicious as it is and gave off a unique texture of a veggie patty. I liked how the bits of quinoa could still be seen throughout the patty as it gave the patty some bite. My only concern was that it was a tad bit too salty - they could probably cut down slightly on the salt. Otherwise, this burger would've been perfect. Even though the sweet potato wedges were equally limp as before, they were still as sweet (if not sweeter), tender (if not more tender) and soft (if not softer) as before and this time they were seasoned better with visible peppercorns. The coleslaw also seemed to have improved, with more flavour and depth. I would definitely highly recommend this dish to everyone, not just vegetarians/vegans as this burger beat the salmon burger HANDS DOWN. This was my friend's sunny eggs on mushroom wholemeal handmade pizza. 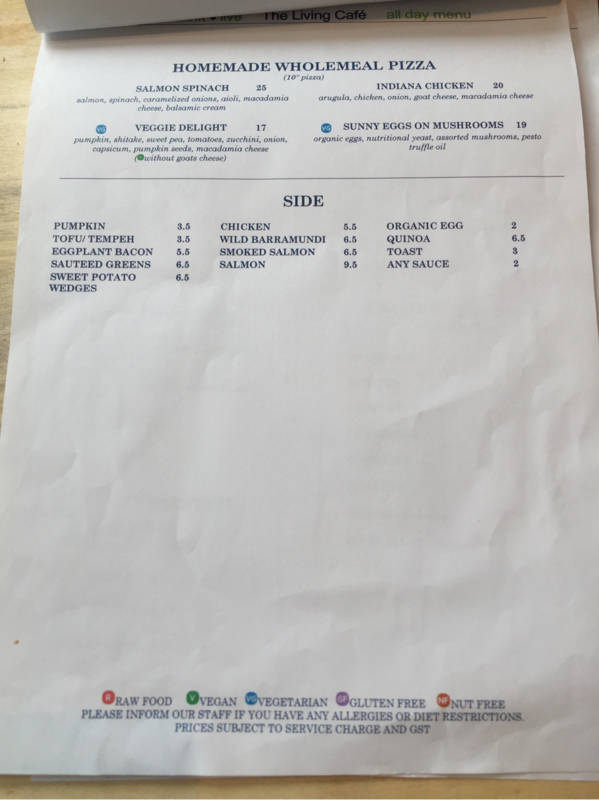 Being a regular customer here, she has tried almost every single thing on the menu already, but had yet to try this specific pizza. This pizza was really pricey, at almost $20 for a single 10" thin-crust pizza, but considering the amount of mushrooms that the pizza was topped with, as well as the fact that they were pretty generous with the pesto and eggs and that truffle oil was drizzled on it, I think that it is pretty worth it. I didn't really try her food, but only tried a little bit of the crust of the pizza, which was really crunchy and delicious! We couldn't help but compare this to the $22 macadamia-crusted pizza we had at Afterglow and both agreed that both are equally crispy but Afterglow edged it out slightly with its unique nut-based crust and more generous toppings. The eggs on this pizza looked different from the regular ones we buy from supermarkets in terms of the colour of the yolk as this egg has yolks that are of a darker shade of yellow than the regular ones we get from the supermarket. My friend also commented that this pizza was a little out of shape and less generous in terms of toppings as compared to those she had in the past. She did like this pizza though, so I guess it's a recommend from her. This is the raw blueberry 'cheese' cake I shared with my mom on my first visit here. Previously, I had seen pictures of this cake being posted on Instagram in The Living Cafe location tag and thought that this must be the must-order when I come and visit this cafe. This cake is made out of psyllium husk, cashew, lemon, soy lecithin, coconut oil, blueberry, Irish moss and xylitol - half of which I haven't even heard of in my life. I was really really excited to try this cake. Unfortunately, I didn't like this cake at all. The crust itself was not crispy (probably because it was raw), the 'cheese' itself had a really weird texture and was visibly tasteless other than its sweetness. Lastly, the blueberry top was indeed blueberry-ishly sweet but had the same weird texture as the 'cheese' portion of the cake. Overall, this cake was pretty much a letdown and totally not worth its price. 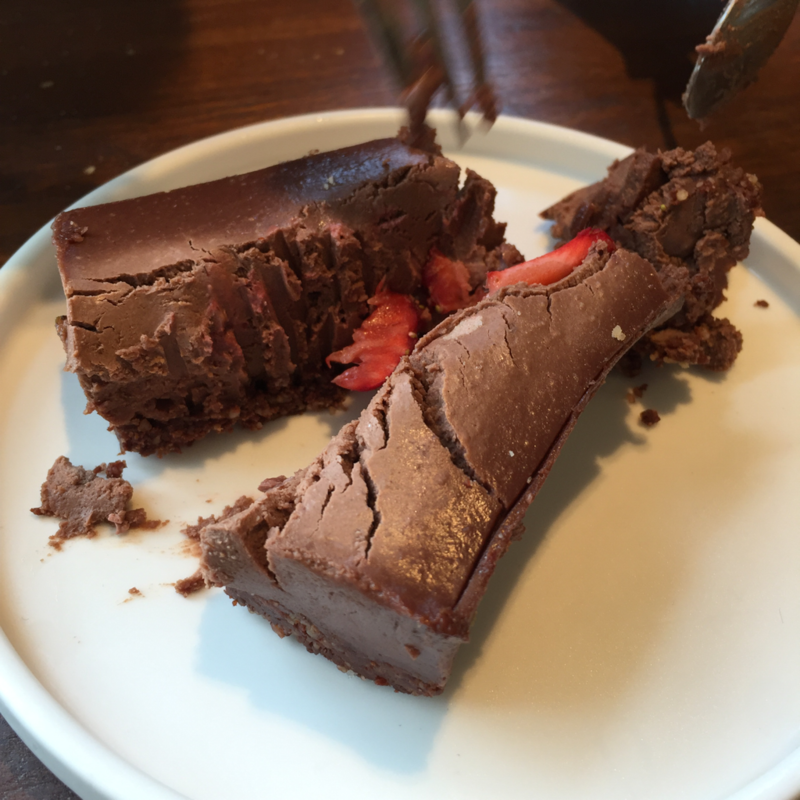 On my next visit with my friend, we ordered this raw chocolate 'cheese' cake, which neither of us have tried. According to the label, this one is made out of almond, walnut, pecan, dates, cacao, pink salt, vanilla essence, cashew and honey. All of these ingredients are way more familiar to me as compared to those in the previous cake, which may or may not be the reason why I preferred this one way more. The cake itself was really rich and chocolatey - perfect for chocolate-lovers! However, it was a bit too thick which made it a bit cloying and gelatinous after awhile. Also, it was extremely hard to cut through (refer to the video of it being cut here on my Dayre), which could have been because it was kept in the fridge at too low a temperature. The crust was pretty much merged together with the cake, such that it could hardly be tasted as its texture was almost the same as the cake itself, not crunchy nor crispy. It was also topped with fresh strawberries, which were slightly sour, and went well with the sweet rich chocolatey cake. I would definitely recommend this cake. However, again, we couldn't help but compare this cake to the $12.50 raw chocolate salted caramel fudge from Afterglow. In terms of price, Afterglow is evidently much more expensive, at around 1.5 times of this raw chocolate 'cheese' cake from The Living Cafe. 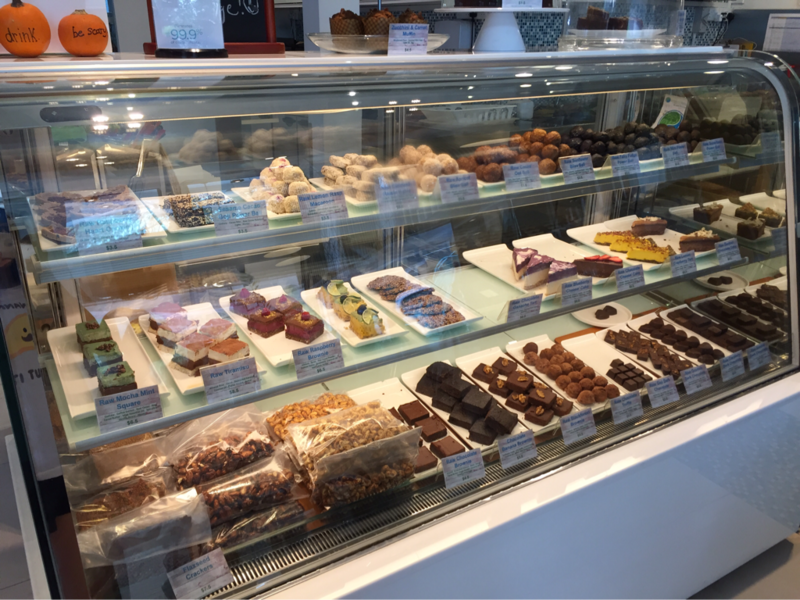 However, we both unanimously agreed that that cake from The Living Cafe won hands down as its texture was way better - smoother, creamier, not as hard. The extra layer of salted caramel also made it extra special, while the crust had a contrasting texture from the cake. 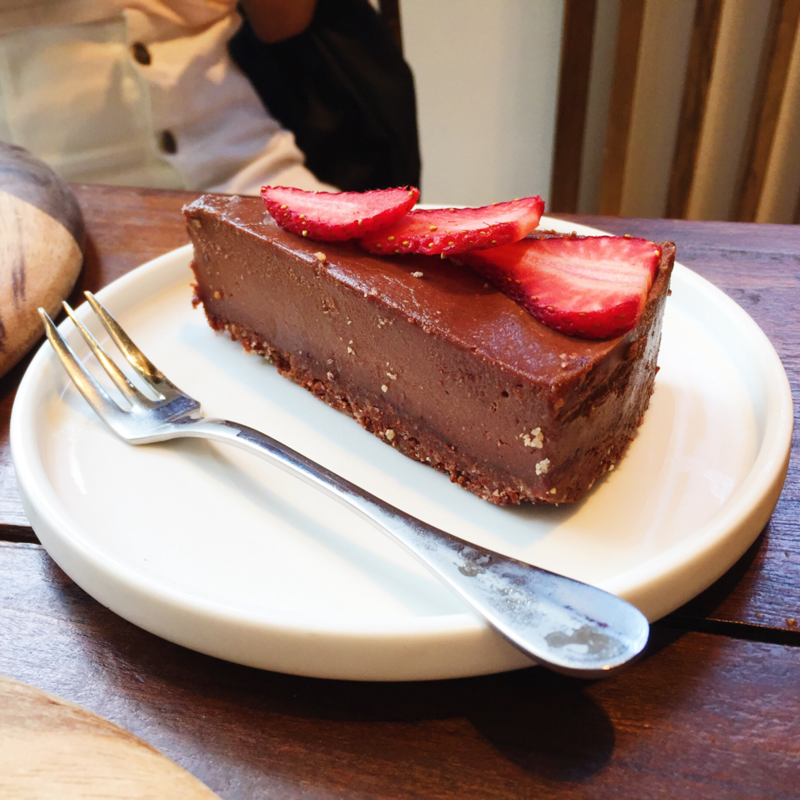 So, even though I may recommend this chocolate 'cheese' cake when you come to The Living Cafe, I also urge you to give the chocolate fudge from Afterglow a try as well and give me your input about which one you prefer. 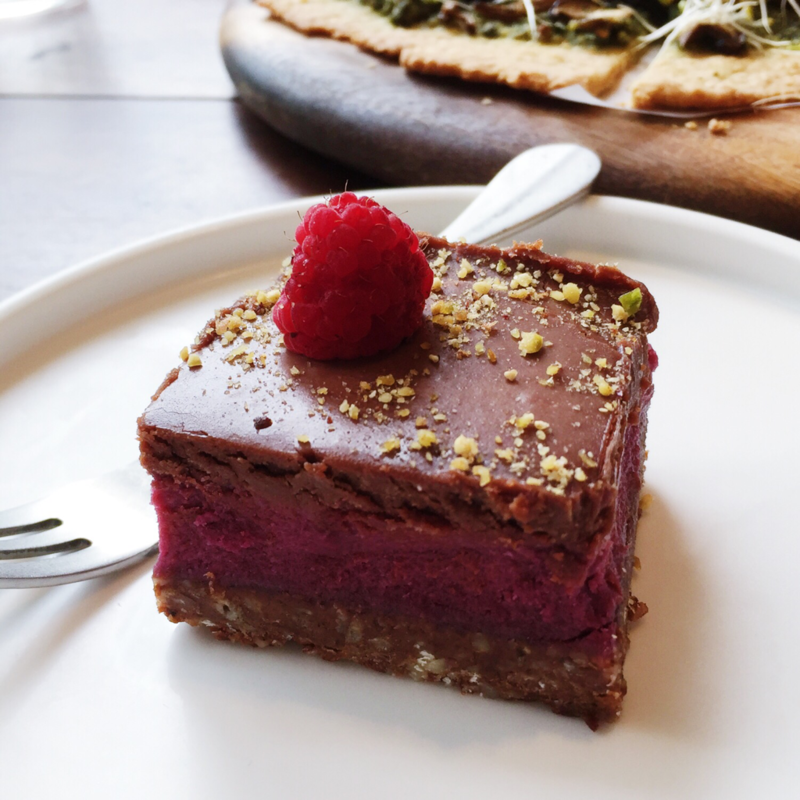 This was the other cake we got on my second visit here - the raw raspberry brownie, which is made up of almond, dates, raw cacao powder, cashew honey, raspberry, coconut oil and raw cacao butter. Again, this cake is made up of pretty familiar ingredients. This cake was pretty delicious, with good contrast between the tartness of the raspberry and the rich creaminess of the chocolate. However, again, this cake was really hard and difficult to cut through. Overall. it is quite a good cake but nothing spectacular in my opinion. 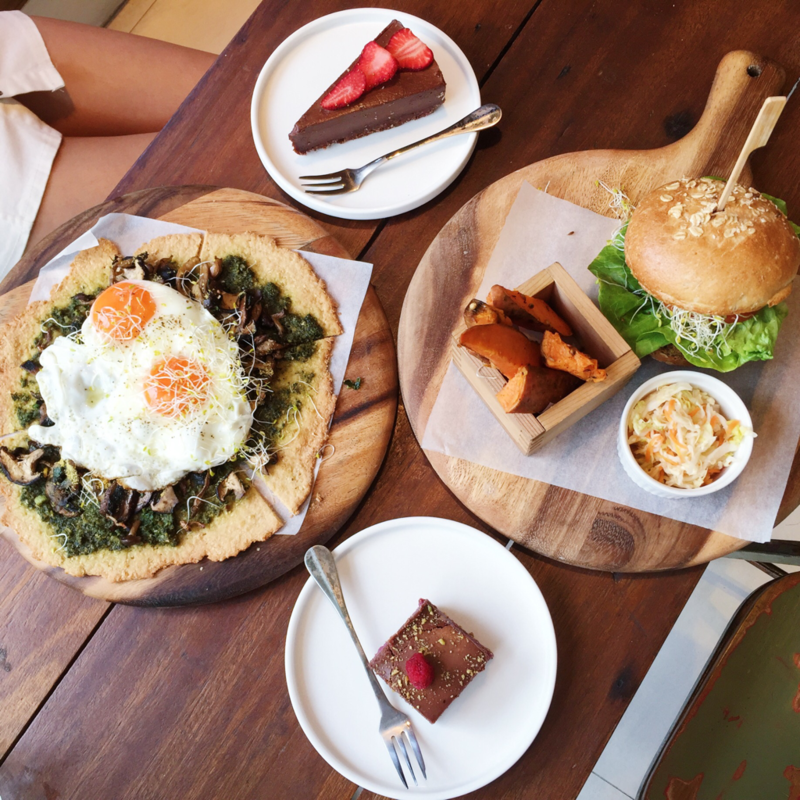 In conclusion, The Living Cafe is definitely one of the more highly-priced cafes but I feel that the high food quality pretty much justifies its price. 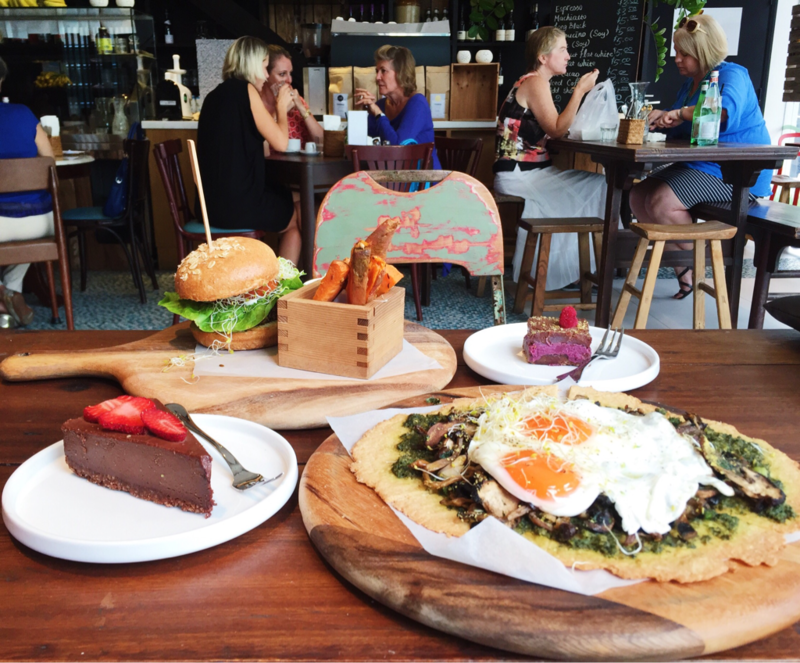 Even though The Living Cafe has some above average desserts, I personally feel that they specialise more in savoury food. 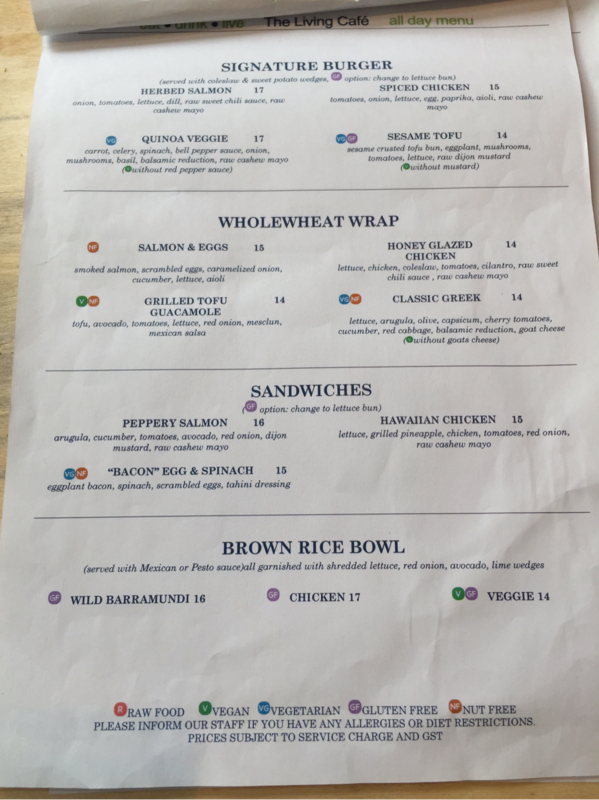 I would definitely recommend the quinoa veggie burger from this place from all the food thus far, but I will definitely come back to try more food and give more recommendations! 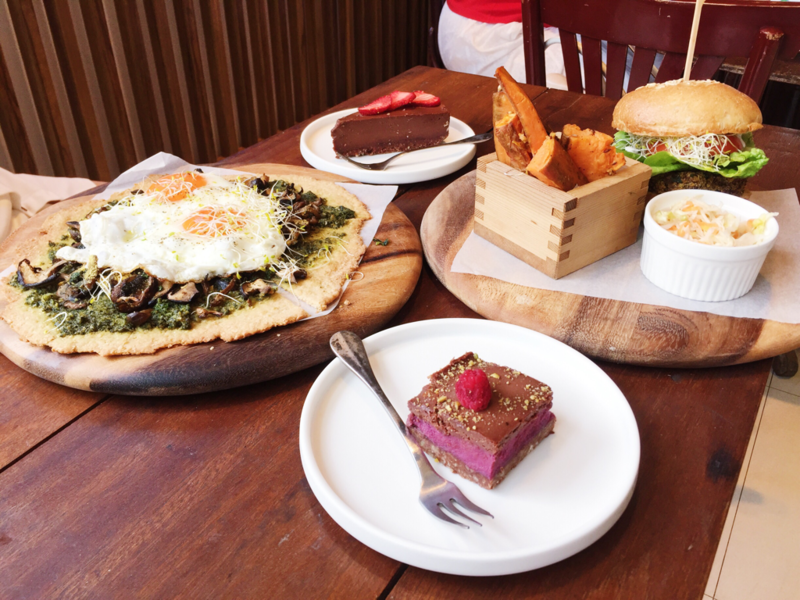 On my future visits, I plan to try their apricot pistachio quinoa, zucchini pesto pasta, rawoasted broccoli mushroom pizza, grilled tofu guacamole wrap and "bacon" egg & spinach sandwich.